Lake McConaughy is a boater's dream come true. Whether you have your own boat or you’re interested in renting one, Van’s is just the place you are looking for. For those without a boat, Van’s rents 18 foot aluminum fishing boats with 25 hp motors. 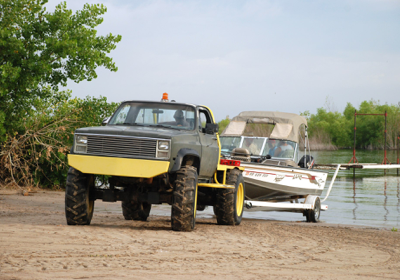 Pontoon boats are also available for rent with 50 hp motors. Rental boats also include a depth finder/fish locator. Paddle boards are also available for those that want to give the popular sport a try. Sorry skiers, there are no ski boats or jet skis for rent. If you’re not in the mood to do it yourself, we have a tug service available as well. Our concrete ramp is useable at this time. Check back often for updates. There is gas available at the general store and at the marina on the water. We carry marine oil, shear pins, anchors, life jackets, ski vests, ski flags and many other boating items. Life jackets are included in all rentals. A rental day is from 7 A.M. to 5 P.M. Boats will not pull tubes or other toys. Down payments required on reserved boats. One-way same price as round trip. *Rates may change with water level fluctuations.